(Boston, MA) While I try not to make a habit of going to see religious shows, there’s something about the themes of religion that is compelling. They bring people together and allow them to question anything from faith and love to forgiveness and existence. 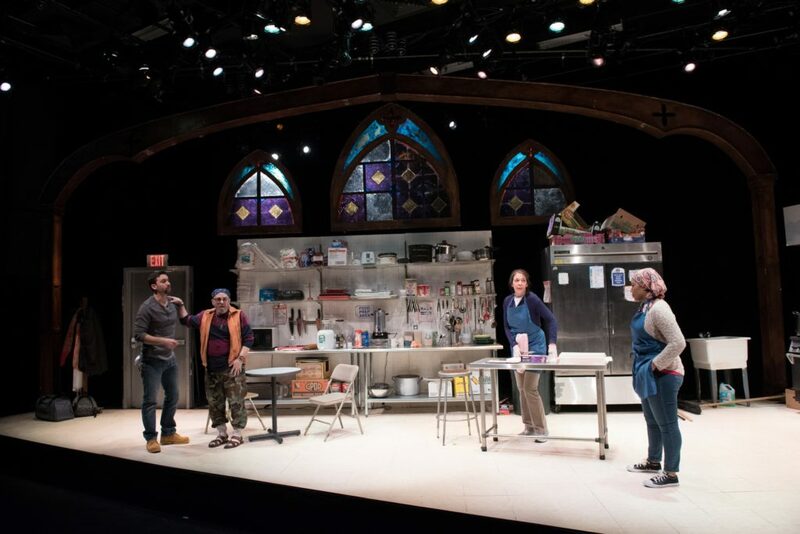 And while playwright Heidi Schreck’s Grand Concourse manages to tackle all of these, what’s captivating about the show is that it does so without forcing religious concepts. Shelley (Melinda Lopez) is a middle-aged nun struggling with her religious duties and beliefs. Despite this, she manages to run a smooth operation as the head of a soup kitchen in a Bronx church, along with the help of Oscar (Alejandro Simoes), who acts as security and groundskeeper. New volunteer Emma (Ally Dawson), a 19-year-old college dropout, is excited at the prospect of giving back to the community, and though Shelley at first has low expectations, both seem more than pleased when the relationship blossoms into a lovely friendship. But soon, secrets start floating to the surface, stirred like soup, until they have nothing left to do but rise up. What struck me right away about Grand Concourse was Jenna McFarland Lord’s set design. It isn’t particularly complex; in fact, the simplicity is what was so appealing. A bay sink, refrigerator, a microwave, shelves of ingredients, and hanging bits of stained glass made the kitchen feel homey and familiar without losing functionality. Anyone who has ever worked in an industrial kitchen could jump on stage and immediately feel oriented and ready to cook. This may seem so basic, and it is, but the set helped establish the entire world of the play and mirrored the simple beauty of the characters that inhabited it. This beauty stems from the unique realness of each character. Oftentimes in theatre, the story involves people caught in some exciting incident that’s heightened from reality. But every single person in Grand Concourse was tangible and could easily be placed as someone you know in real life. They were normal people going about their daily lives; the struggles, the laughs, the mundane, the heartbreak. It triggers a sense of compassion, not for their averageness, but for the profundity of their entire existence and how it connects them to everything. With such a small group of characters, the performances become more important because there’s nowhere to hide. Thankfully, the show is well cast. Lopez brings the perfect mix of unsteady conviction and passion to Shelley, and makes a nun secluded in a kitchen feel like a woman you already know and love. Dawson as the depressed and desperate for love teenager manages to melt the angst of adolescence with her honest portrayal of depression. Depicting the charismatic groundskeeper, Simoes has the right amount of charm and flirtatious likeability without making Oscar cliché. And Thomas Derrah as Frog, a kind and psychologically unstable soup kitchen frequenter, steals every scene he’s in with ease. Derrah’s performance is such a marvel that it isn’t even acting, it’s absolute truth. The special attention given to the sound design (Lee Schuna) in this show was greatly rewarded. Actors on stage could easily transition between scenes, and the slow tempo of the tunes instilled the serenity and grace of the show and its message, while maintaining the audience’s attention. Where the show falters is in its conclusion. As most religious shows tend to, forgiveness was a big theme for Grand Concourse, but as this unfolds in the finale, the story feels incomplete. The problem is that it doesn’t instigate or even suggest a conversation with the audience. Instead, the show kind of just ends in an unsatisfying finality, and for that reason, it peters out. Even with its lackadaisical ending, Grand Concourse is a wonderful show and production that dares to tell the stories of everyday people. And there’s something extraordinarily stunning to be said about that. Grand Concourse runs for 1 hour, 40 minutes with no intermission. To purchase tickets, click here. This entry was posted in Comedy, Uncategorized and tagged 2017, Alejandro Simoes, Ally Dawson, April, Boston, Bridget Kathleen O’Leary, Community, Glenn Perry Photography, Grand Concourse, Heidi Schreck, Jenna McFarland Lord, Lee Schuna, MA, March, Melinda Lopez, religion, Speakeasy Stage Company, Thomas Derrah, Travis Manni by Travis Manni. Bookmark the permalink.